Herbs are rewarding to grow in our backyard gardens because they are best when fresh, are used frequently and are only needed in small quantities. It doesn’t take a lot of effort to be self-sufficient in basil, parsley (except in the wet season), rosemary, lemongrass (we have enough to give away – just ask!) and so on. 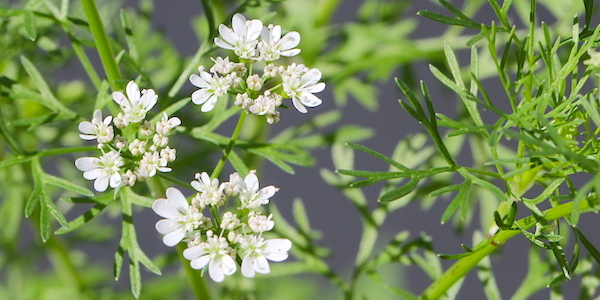 Coriander, however, has been a problem: in our climate, it “bolts” – that is, goes very rapidly to seed and then dies. That’s doubly frustrating because it is an essential flavour in Asian cooking and, when bought by the bunch, it doesn’t keep well. Coriander (Coriandrum sativum), also known as cilantro, Chinese parsley or dhania, is an annual herb in the family Apiaceae. Coriander is native to regions spanning from southern Europe and North Africa to southwestern Asia. 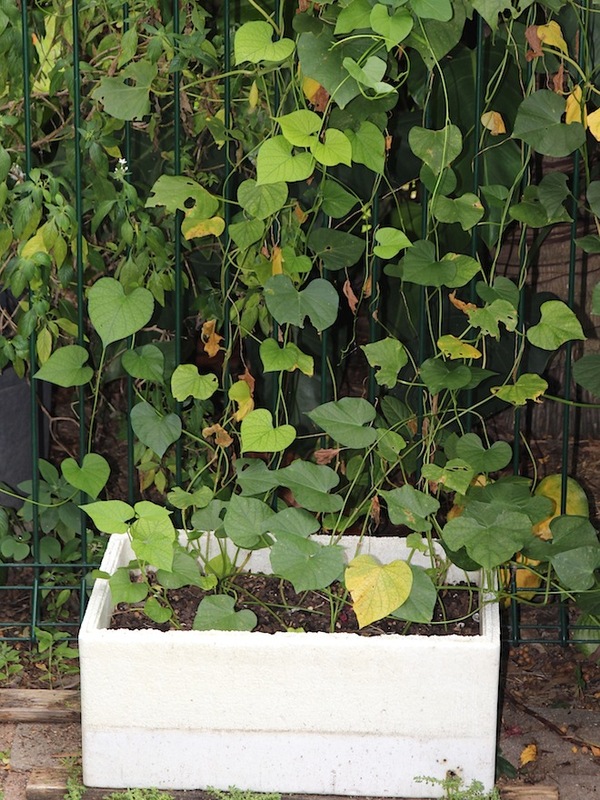 It is a soft plant growing to 50 cm (20 in) tall. 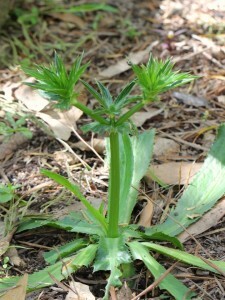 The leaves are variable in shape, broadly lobed at the base of the plant, and slender and feathery higher on the flowering stems. Cilantro is the Spanish word for coriander, also deriving from coriandrum. It is the common term in North America for coriander leaves, due to their extensive use in Mexican cuisine. 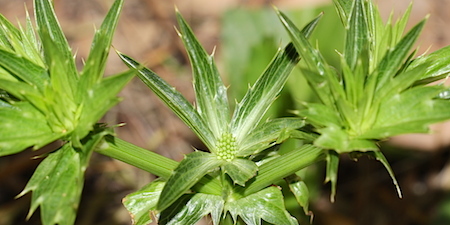 A few months ago we found an alternative, which we bought in a pot labelled “Sawtooth Coriander (Eryngium foetidum)” and planted out in the garden. Its appearance doesn’t suggest any relationship with coriander but crushing a leaf puts the connection beyond doubt: the aroma is exactly the same. 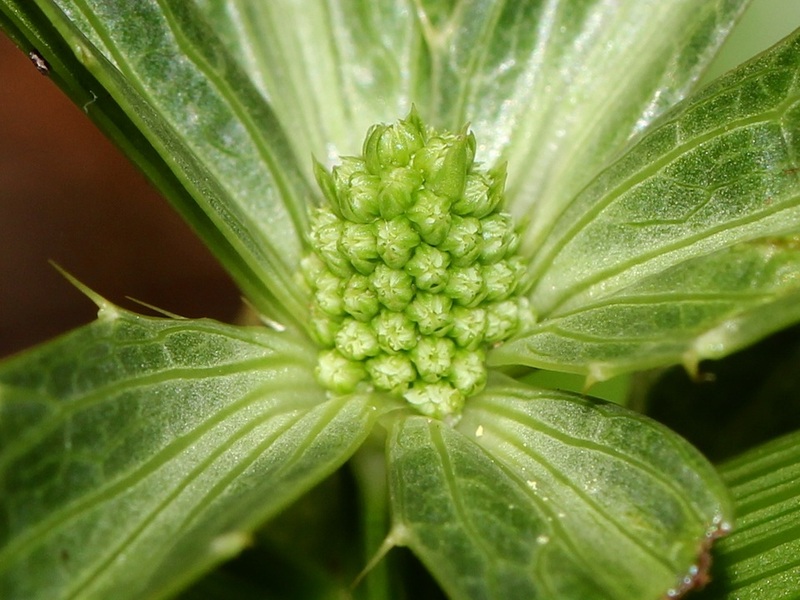 The common names recognise the connection, too: Sawtooth Coriander, Thai Coriander, Pointed Cilantro or Thorny Coriander. The only tricky one is “Culantro”, just one letter away from “Cilantro”. E. foetidum is widely used in seasoning and marinating in the Caribbean, particularly in Panama, Puerto Rico … and in Peru’s Amazon regions. 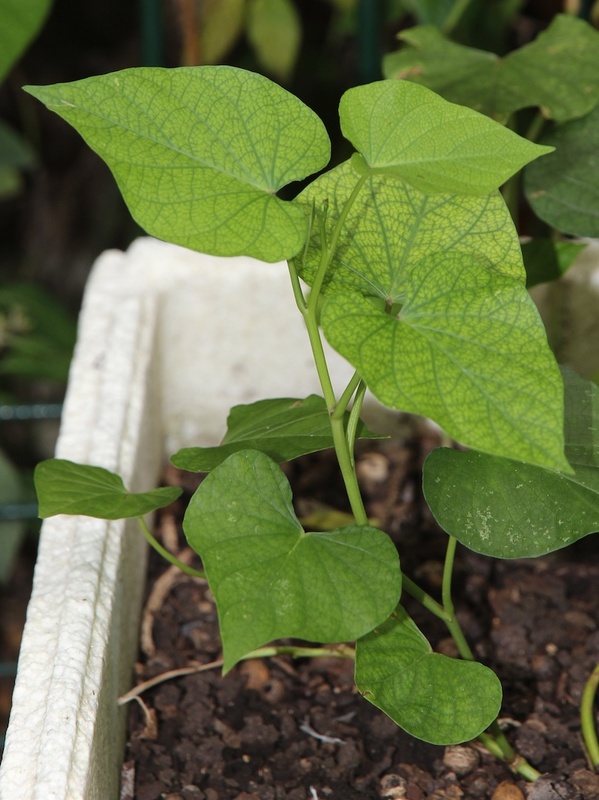 It is also used extensively in Thailand, India, Vietnam, Laos, and other parts of Asia as a culinary herb. It dries well, retaining good color and flavor, making it valuable in the dried herb industry. It is sometimes used as a substitute for cilantro (coriander in British English), but it has a much stronger taste. The cultivation notes that came with our pot said “remove flower stalks when forming” and we did remove them once we realised what they were. The notes also gave another common name for the herb: Perennial Coriander. So far, so good! Persicaria odorata, the Vietnamese coriander, is a herb whose leaves are used in Southeast Asian cooking. Other English names for the herb include Vietnamese mint, Vietnamese cilantro, Cambodian mint and hot mint. The Vietnamese name is rau ram, while in Indonesia, Malaysia and Singapore it is called daun kesum or daun laksa (laksa leaf). It’s in a different family (buckwheat or knotweed family) and looks quite different from either of the other two – more like a grass – as you will see if you click on the wikipedia link. We have always had a few food plants in our garden and have very gradually been moving towards growing more. The list at the moment includes tomatoes, at least half a dozen herbs, chillies (the same old bush is still producing), bananas (two varieties with another one promised), jaboticaba (if a handful of fruit every year or two can be counted) and the macadamias and mangoes which were already established when we bought the house. 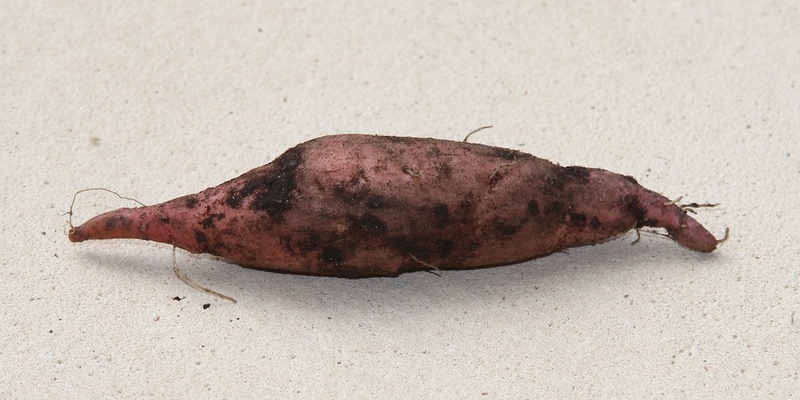 Sweet potatoes keep better on the bench than in the fridge but early this year we left some there a bit longer than usual and they began to shoot. Why not plant them? No reason at all, so they went into a styrofoam box full of soil and compost, the box went against the pool fence, and we waited. Then waited some more, because Leonie Norrington (in Tropical Food Gardens) is adamant that they take four months to mature. Eventually we decided that it must have been four months since we planted them, and dug them up. 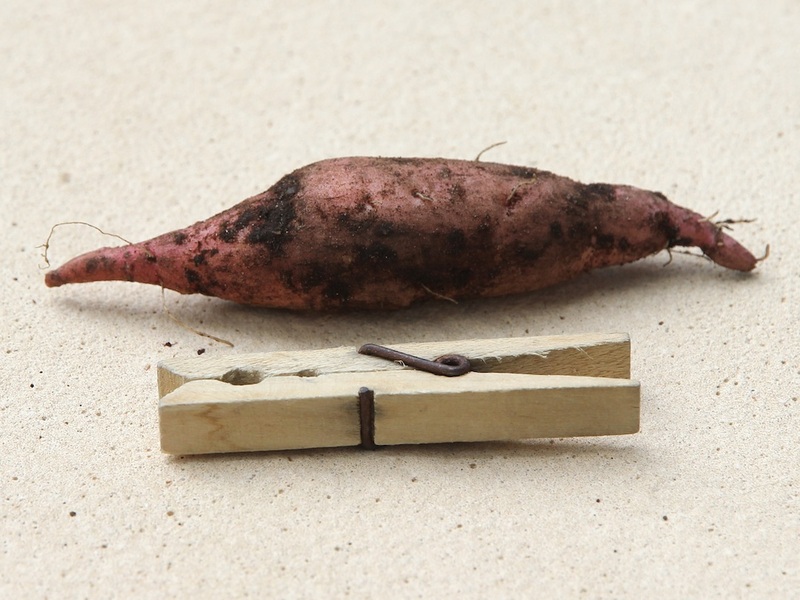 The good news was that we had succeeded in growing sweet potatoes. The not-so-good news was that the tubers were not very big at all – click on the top photo to see just how big that one is. Why were they so small? I don’t think the box was big enough. The roots had formed quite a dense mat throughout the soil and I think they would have gone much further if they had had the chance. It’s also possible that they wanted more water than they got. But we knew that the basic idea was sound enough and started looking for a better spot to grow more. Yesterday I planted out another few chunks of sprouting tuber against the fence under the bananas in ground which the scrub turkey had unwittingly helped me to clear and level. We’ll see how they go. Custard apples on our tree. The odd-looking pale thing at lower right is a flower. I mentioned custard apples recently in my post about the Mangosteen and now it’s time to feature them. We planted a few exotic fruit trees 10 – 15 years ago, not with any great ambitions of producing much of our own food but more for the interest in seeing how they went. Mostly, I have to say, the trees have been more decorative than useful. Often they don’t produce at all and when they do, the possums often get to the fruit long before we think it is ripe enough to pick. This year, though, the custard apple tree looked promising: when I took this photo a month ago, there were at least half a dozen healthy-looking fist-sized fruit. They were quite hard, however, so we still had to wait and watch. Yesterday I looked at one of them and saw the bumps had separated, showing yellow between them. That’s the sign of ripeness, so I squeezed it – and it was so soft it almost collapsed in my hand. I picked it at once and it turned out to be a little over-ripe but still delicious. It may not have been the first we’ve ever had from the tree but it was certainly the first for some years – as I’ve said, the bananas provide more fruit than all the rest of our garden put together. “Custard apple” is a name which is used quite loosely in our area to refer to a group of related species, all apparently native to South and Central America. 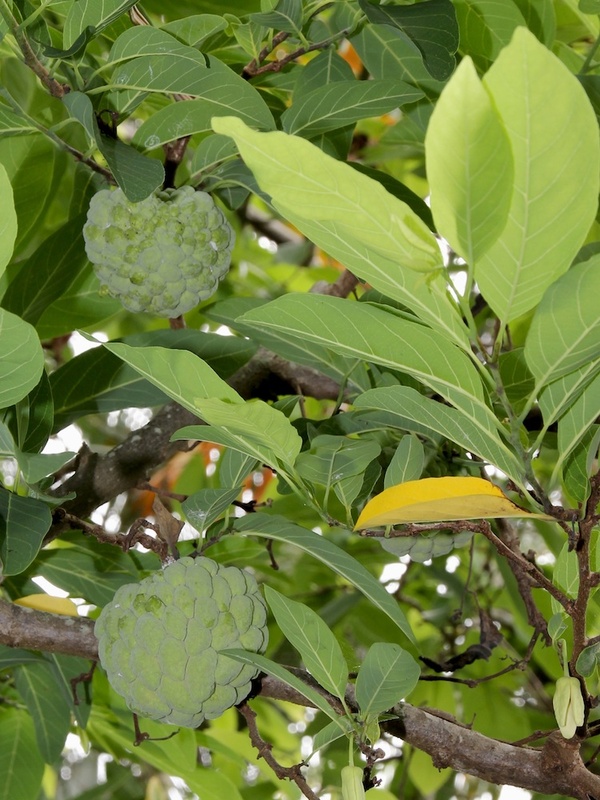 A bit of research suggests our tree is more correctly called a “sugar apple” – that it is an Annona squamosa rather than the custard apple proper (Annona reticulata), cherimoya (Annona cherimola) or an atemoya (a cross of A. squamosa and A. cherimola). The Soursop (Annona muricata) is another member of the family but is the odd one out in terms of its fruit – no-one would ever call it a custard apple! The in-line links above all take you to wikipedia pages. Update, October 2015: I recommended The Australian Tropical Fruits Portal Custard Apple page when I wrote my article but it seems to have vanished. The Archives of the Rare Fruit Council of Australia may be a useful alternative.